I love my sis. She’s funny and smart and the Best big sister. But she’d probably kill me if she knew I was posting the evidence of her latest addictive obsession little pastime for all the world to see (nobody tell her, okay?). When the spider (that would be me) catches the fly (that would be her) she wants to share the good news. My own knitting? A sock heel here, a washcloth there. Nothing major, but all good. I need to get going on the Christmas shopping, though — right now, today. What makes me think I can bend time? Eleven days is eleven days, and I’ll be spending eight of them at the store helping other people with their shopping. I have a tree to put up, festivities to attend, and cards to make (yeah, like that will happen), and the last time I checked it was December 14th. 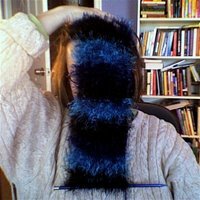 Ahh… I know this well (says she who has left her husband sitting alone at a table in a restaurant so she could get better cell reception in order to answer a “knitting emergency” question of her mother’s…)My personal favorite is that I taught my mother to knit because she was watching me knit a lace hat I designed. She has seen me knit socks, sweaters, and numerous items. And she scoured the internet and came to me one day with a “pattern” she thought I’d like – which was the Harlot’s simple hat. Mom didn’t think I’d know how to make one so she didn’t ask.Thanks, Mom.Guess you never grow up to Moms, do you?